When is a line not a line? When it’s an object! That sounds like either an annoying riddle or a really bad joke, but when it comes to details in Revit, it’s just the truth. When we’re working with 2D views in Revit, they’re often a combination of live objects (e.g. beams/walls/floors), detail components (e.g. break lines, miscellaneous framing, rebar), and detail lines. I know there are some people out there who advocate against the use of detail lines at all, but we’re not able to do without them completely yet. However, the distinction between detail lines & components confused me for a while. Specifically, why weren’t the line styles in my project the same ones I saw when editing a detail component? In hindsight, the pull-down headings (“Line Style” vs. “Subcategory”) should have tipped me off. But a lot of the names were the same, so I’d get confused when I’d see something in one place and not in the other. 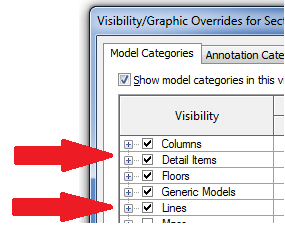 Turns out that Detail Lines — which only exist in projects — are considered “lines” and are controlled by that category in the Visibility Graphics dialog. “Lines” in Detail Components — which exist only in families — are considered “objects” and are controlled under the “Detail Items” category of Visibility Graphics. In our office, there’s a lot of overlap between the styles in each category, which makes sense given that they both serve a similar purpose of adding 2D geometry to sections and details. But it also helps explain why I overlooked the differences! I think the thing I find most confusing about Revit is the multiple terms for very similar objects. Things that might be synonyms in daily life have very different meanings inside Revit. At any rate, that’s one minor mystery cleared up. On to the next!